Most homeowners don’t know where their main shut-off valve is located, says Grier, but every homeowner should. Typically, he says, the valve will be located on the lowest level near the front of the home. And it will look something like the image in Figure 1. Figure 1. 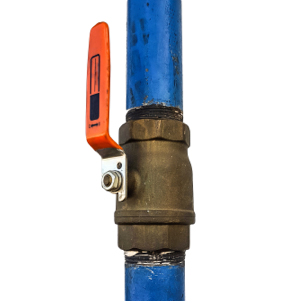 In most homes, the main water shutoff valve will be located on the lowest level near the front of the house. Figure 2. 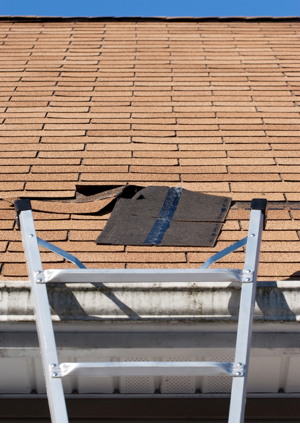 Missing or damaged shingles are a common cause of roof leaks. When water’s coming in through the ceiling, it may be tempting to get into the attic or up on the roof to see where it’s coming from. “Don’t do it,” says Ryan Baxter of RIBA Construction in Fairfax, Va. “This presents a huge safety issue — especially in inclement weather — and most roofing companies will be able to prioritize your active leak and provide a temporary fix to ensure things don’t get worse.” The best thing you can do in this scenario, says Baxter, is try and stop the water with a bucket or another large basin. Then, call a roofing pro to come and assess the damage. Prevention: Typically, Baxter says, roof leaks happen when shingles blow off, nails rust out or flashing is worn. And many times, only a trained roofing pro will be able to see and identify the issue. Regular roof inspections will identify potential problems and prevent those kinds of things from happening. A leaky toilet creates a sense of urgency, as water can penetrate through flooring and cause even bigger problems down below. But Grier says leaky toilets don’t usually constitute an emergency. “I must get 50 calls a day about leaky toilets,” he says, “but most people don’t really need a plumber to fix this; in fact, most people can fix a leaky toilet themselves.” First, simply turn off the water supply at the base of the toilet, says Grier. Then, replace the flapper in the inside of the tank and turn the water back on. Figure 3. 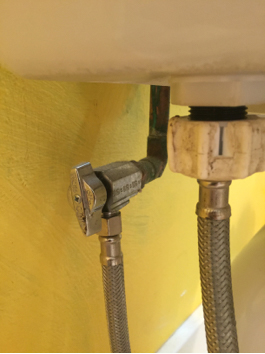 Use the valve near the base of a leaking or overflowing toiler to turn off the water supply. Figure 4. 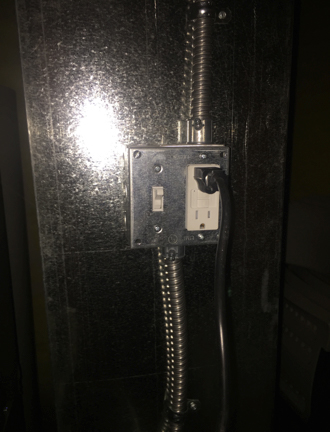 Locate the on-off switch (usually a silver or white switch) on your furnace to cycle the power. If your furnace isn’t working, first try cycling the power — turning the power off for five minutes and then turning it back on (either at the breaker or using the on-off switch on the furnace), says Tom Griffin of NoCo Heating and Air in Fort Collins, Colo. This will reset the alarms in the system. Then, turn the thermostat on and see whether the heat comes on. If cycling power doesn’t fix the problem, you may also try changing the filter. “Nine times out of 10, a dirty filter is the culprit,” Griffin says. But if a clean filter doesn’t work, it’s time to call a qualified heating, venting and air condition (HVAC) professional. The single worst thing you can do in this scenario, says Griffin, is to consult YouTube videos and try and repair the furnace yourself. Even taking the door off your own furnace will void your warranty and deter any qualified professional from working on your furnace, says Griffin. Prevention: Check your furnace filters monthly and replace dirty filters as needed. Also, have a qualified HVAC professional inspect and service your furnace once a year. Regular maintenance will prevent problems and keep your furnace in good working order. Kitchen fires are the leading cause of home fires and home injuries, says the National Fire Protection Agency (NFPA). And the leading cause of kitchen fires is unattended cooking. The NFPA warns against leaving cooking food unattended, and the organization recommends keeping a lid nearby when you’re cooking to smother small grease fires should they occur (use metal; glass may shatter at high temperatures). In the case of an oven fire, the NFPA recommends turning the oven off and keeping the oven door closed. Figure 5. 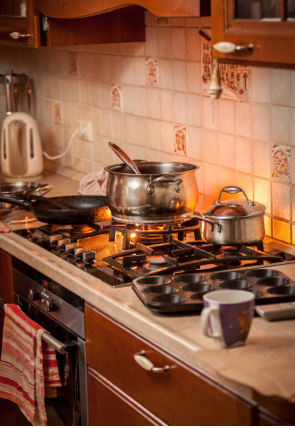 Unattended cooking is the leading cause of home fires. Prevention: Stay alert and keep watch over frying, grilling, boiling or broiling foods, advise both Cole and the NFPA. And check on simmering, baking and roasting dishes regularly. Also, keep anything that can catch fire — oven mitts, wooden utensils, food packaging, towels or curtains — away from your stovetop. And heat oil slowly to reduce the splatter of flammable oils and grease.